Last weekend I picked up The House of Silk. I finished it Sunday night after Downton Abbey. Silk, for those unaware of it, is a Sherlock Holmes pastiche novel written by Foyle’s War‘s Anthony Horowitz that was published in late 2011 and was authorized by the Doyle estate. The latter point — the estate authorization — seemed to be a very big deal, as the book was reviewed in a number of outlets where you wouldn’t ordinarily expect a Sherlock Holmes pastiche to be reviewed and it was treated as a piece of Serious Literature. I didn’t find Silk to be anything special. Indeed, I found it slow-going in places. The story begins with an art dealer, Edmund Carstairs, who believes he’s being pursued by an assassin from Ireland that he encountered years before in Boston. This assassin is notable for his scarred face and his flat-cap, and one day he accidentally crosses paths with the man outside his house. Frightened, he turns to Sherlock Holmes, and Holmes then begins an investigation into a what appears to be rather mundane case — until the assassin turns up dead, one of the Baker Street Irregulars disappears, the Irregular also turns up dead (and with a message), Holmes begins to hear whispers about a place called the House of Silk, and, after a warning to stay away from the House of Silk, Holmes is arrested for murder. On paper, the concept is fine. It’s not particularly original; throughout, I thought of some of the more lurid Jack-the-Ripper theories (like any of the ones involving Queen Victoria’s nephew and/or Sir William Gull). And it does tie together well. 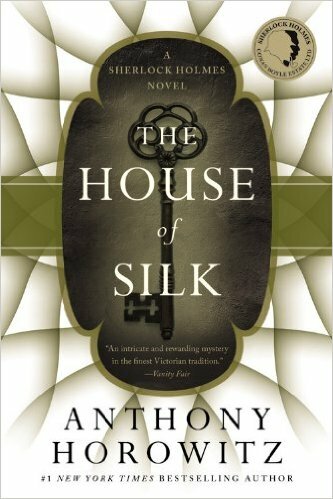 (I’d figured out what the House of Silk was about twenty pages before Watson.) It’s the execution, however, that leaves much to be desired. I will say one positive thing about the book — it rewards the attentive reader. It’s a lot like the first Downey film in that regard; all of the elements of the solution are presented, and even if they don’t seem particularly important at the moment they occur. Though I figured out what the House of Silk was (but not where it was, though I should have), it wasn’t entirely because of the clues laid out; there’s a piece of narrative misdirection when one of the major clues to the House is presented. Rather, it was more of an intuitive leap on my part because the solution I imagined seemed like the only thing that would justify the lengths to which the House went to cover its tracks. Silk isn’t the worst pastiche I’ve ever read, but it’s also far from the best. The estate authorization, when all is said and done, doesn’t seem like that big a deal because the book doesn’t feel like it does anything new enough and different enough to justify it.